Online attribution is a thorny subject. Peter O’Neill thinks that “the data it is possible to collect will always be incomplete – leading to incorrect interpretations & decisions”, whereas Derek Tangren of Adobe thinks “The devel­op­ment of an advanced mar­ket­ing attri­bu­tion model can be incred­i­bly insight­ful“. 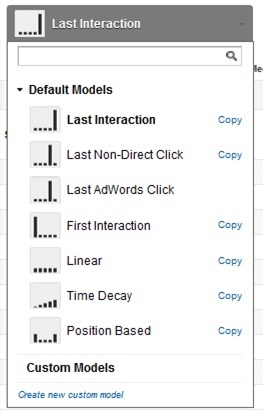 With that in mind, let’s look at Google Analytics’s online attribution modelling is an interesting proposition. Useful or useless? Your man on the street is here to help you decide. Google’s attribution model comes in various different forms (more so than the equivalent at Omniture where you have the choice of first, last or linear). You can even come up with your own model if you really want to spend the time and effort doing so. Convert based on last interaction – this is your classical conversion. However many times the visitor interacted with your site, the most recent visit will be the one that gets the full value of your conversion. 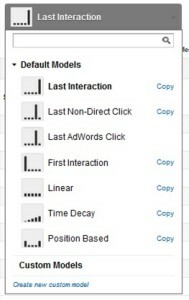 Convert via last non-direct click – bizarrely, this is how the rest of Google Analytics works (hence its inclusion in the list). The last bit of online marketing causes the conversion. Anyone coming back through (direct) at a later date to convert will convert against the previous campaign. Why on earth you’d want to ignore the last visit if it was from (direct) is beyond me – our brand marketers do lots of hard work so that people remember your site whether it is through offline methods, display advertising or other. You really only want to use this if you are trying to prove that your online Marketing is more effective. Use if you want consistency, but otherwise avoid like the plague. Last Adwords Click – use this if you are evaluating the performance of your adwords. All this will do is confirm that your ad agency isn’t screwing you over when they give you their reports. But this is probably all your going to get out of it, because why would you want to ignore all the other sources? First Interaction – The thing that made your visitor arrive at your site in the first place. Sure, you had to work hard to get them to convert in the end, but the bit at the beginning was what drew their attention. You don’t want that email that you send to everyone a the end anyway to get any credit. This sort of report will delight those who spend lots of time and effort marketing to those who have never heard of you before, but poor for those who are coming back through paid search brand terms. Linear – each of the visitors interactions gets equal attribution. This is great if you are a bit lazy and just want to give each of your various different types an equal amount of attribution. It saves you a lot of thought working out what you want to do with the data. Time Decay – the most recent interactions get the most credit, whereas those that were longer ago get less. This is the for the person who thinks that Linear is too lazy, but anything else is too much like hard work. Position based – usually this works on a U shaped model, ie the first and the last get most of the conversion, everything else slightly less. This is for those sites who think that it is hard to get people to the site in the first place, but that it is equally hard to get them to convert over a long time period. If you are using Omniture you can of course use any of these models if&nbsp;you want to code it onto the page, otherwise you are limited to using just a first, last or linear model that you can set in the user interface. Which Model Shall I Use? Are you suggesting here, Alec, that we use more than one model?!?!?! I sure am. Not only am I suggesting that you use more than one model, I’m suggesting that you use them all! Choose the last click model and use it on all your reports because this is what your manager expects of you and it is the least complicated version. Admit that you are going to have to pay your ad agency based on any click from their particular medium (just like Government and terrorists, ad and affiliate agencies do not negotiate with site owners). The main problem with any of your attribution models is of course the problem of cookies. Cookies make anything visitor related quite difficult because it starts to get innacurate within weeks if not months. Added ot this we now have people using more than one device with different cookies and different visitor sessions. Basically this may mean that almost everything it is going to give you one visit conversions – this is something that you should check out first before spending lots of time and effort working out which attribution model you should use (if all your visits convert on visit number 1 – or what appears to be visit number 1 because they’ve deleted cookies – then all your models will give you the same result and you shouldn’t spend any time worrying about them). All analytics is based on making changes and looking at the impact of the changes by monitoring conversions. Different models will help you decide where you should be looking at making changes, but the proof is when you make a change and monitor the impact. For example if your paid search for brand terms looks like it is causing conversions by last click, U shaped distributions and other means causing you to think that you should increase the amount you spend on it, then go for it. But remember that you are going to be measuring the impact of your changes on your KPIs – you want to make your change in isolation to other changes so you can show that this particular change has made the impact on the bottom line. Let’s just make this clear though – you are not monitoring the change in one of your attribution models – you use the attribution models to suggest changes where you monitor the changes in your KPIs. KPIs are the end goals, not changes in acquisition models. If you really want to do attribution modelling then econometric modelling is the way to go. Econometric models will take all your data at the most detailed level possible, and monitor the impact of all of your different channels on the number of end conversions (similar to how TV advertisers prove people who watch their adverts buy their stuff). The advantage that this has is that you can decide on your end conversion, even if it is disconnected from on site conversion, the disadvantage is that it is really expensive and you want to be doing it over a decent length of time. You really want to be doing this six monthly, whilst doing normal attribution modelling on a more frequent basis.